FAQ - Frequent asked Questions Water Damage, Fire Damage, Mold Restoration Services | FAQ - Frequent asked Questions Carpet Cleaning | FAQ - Frequent asked Questions Tile Grout Cleaning | FAQ - Frequent asked Questions Upholstery Cleaning | Florence, AL | Muscle Shoals, AL | Russellville, AL | Alabama | Bamaclean, Inc. Carpet has been the most popular floor covering in America for decades for good reason - carpets feel soft, reduce noise and insulate rooms. But some common misconceptions deter people from buying carpets. Below are some short answers to common questions about carpet and carpet cleaning and maintenance. For some more in depth information please visit our carpet cleaning page. FACT: Multiple scientific studies have concluded that carpet fibers, in trapping and immobilizing potential allergy-causing particulates, can actually help people with allergies. If allergens are in the carpet, they're not circulating in the indoor air stream. Shaw recommends using a HEPA-filter vacuum to fully remove such particles from the indoor environment. Carpet acts as a trap for allergens and is capable of holding significant quantities of soil, dust and other substances. The carpet holds on to the particles until you are ready to remove them. Regular vacuuming, using a high-efficiency filter and periodic hot-water extractions, removes the majority of allergens. To learn more check out our Breathe Easier article and a paper, "Carpet, Asthma and Allergies - Myth or Reality" by Dr. Michael Sauerhoff, Ph.D., DABT. Some carpets may still feel slightly damp for up to 8 - 12 hours depending on carpet and soiling condition. This is normal and will not cause any problems. Follow the these steps to dry carpets sooner. Adjust thermostat to 72 degrees, or if appropriate open windows Turn off humidifiers on furnace. If available run floor fans over carpet. What is the best way to clean and maintain my carpet?. FACT: Simple steps can extend the life of your carpet and keep it looking new. Regular vacuuming once or twice per week, depending on usage, is recommended. Carpet manufacturers recommend never using any kind of a carpet cleaner that uses a motorized brush. This causes unnecessary wear on your carpet and can shorten its lifespan. A Deep Steam Cleaning once a year will maintain your carpet perfectly. If you want to protect your investment, ask your carpet cleaning technician about Carpet Protector. Today, virtually all carpet manufacturers recommend a cleaning every 12 to 18 months. If you are a family that has a pet, a business, or a residence with a lot of foot traffic, an annual Deep Carpet Cleaning makes a lot of sense. This will keep your home or business looking new and smelling fresh. Will my carpet re-soil faster after cleaning? The reason carpets sometime get dirty faster after a cleaning is due to sticky residues being left behind, such as dirt, oil, and even some consumer cleaning products. 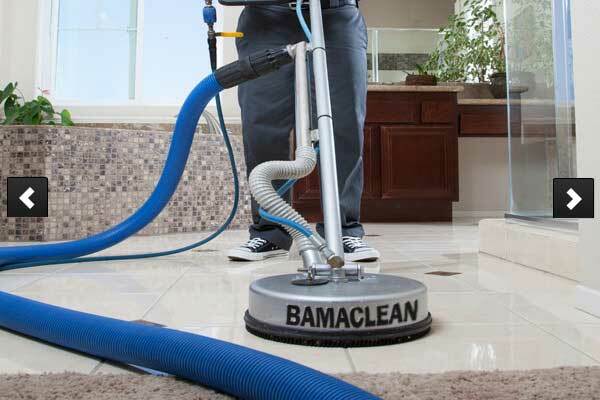 Bamaclean Carpet Cleaning service will not leave any soil attracting residues behind. Your carpets will be vibrant and fresh! Ceramic and porcelain tile make for a very durable floor covering that will last a lifetime. Below are some short answers to common questions about tile floors, cleaning and maintenance. For some more in depth information please visit our tile cleaning page. How does Bamaclean clean tile floors? We hot steam clean and power wash tile floors. Our hot steam deep cleaning system greatly reduces ground in dirt and debris by blasting it out with hot steam and then extracting it out to our truck leaving nothing behind but squeaky clean grout and tile floors. No heavy equipment in your home, just 2 hoses and power wash tool. How long will it take for my floors to dry? If possible, avoid walking on damp or wet floors until dry. That being said your floors are usually dry before we leave. We may place fans to aid in quicker drying. If your grout was sealed it usually better to allow 24 hours before any moping. If available run floor fans over floors. Why do my tile floors and grout get so dirty? In short your mop is probably the main culprit. It’s a known fact that the mop is one of the least effective cleaning tools for removing soil; in fact in some cases it can actually create a safety hazard. Food, grease and other debris are often left behind after moping and this left over debris doesn’t just stay on the floor tile itself it eventually settles into the grout lines too. After time this caked in debris becomes a dark greasy substance that is eventually activated into a slippery slime when it becomes wet from outside water or a damp moping. Our hot steam deep cleaning system greatly reduces ground in dirt and debris by blasting it out with hot steam and then extracting it leaving nothing behind but squeaky clean grout and tile floors. Whats the best way to clean and maintain my tile floors? Mats will help protect tile floors from damaging wear. A good quality entry mat will trap dirt, sand, grit and other substances such as oil that can be tracked onto your floor. Grout sealer is clear and designed to block out stains. Sealer is applied into the grout, making the grout easier to clean. Using furniture pads will prevent damage to your floor. Apply felt or similar pads to the legs of any metal, iron, wood, or plastic furniture that will be placed on the tile flooring. Dust mop and vacuum. Use a neutral cleaner damp mop and make sure to change water in bucket often. Protective sealers do they work? In short yes. Grout sealer is clear and designed to block out stains. Sealer is applied into the grout, making the grout easier to clean. My upholstery looks clean do i need to clean it? Your upholstery could be a lot dirtier than you think! Pet dander, odors and lot of dust may be in your Upholstery. A ton of dust, body oils, pet dander or worse could be lurking in your couch! Even the best of house keepers can find it challenging trying to keep their furniture fresh and clean. "Most people don't have a clue as to what's in their furniture. If they did, you would see a lot of dropped jaws”. If you’re pet likes to sit on your couch it could have high concentrations of pet dander. Did you know that people can carry pet dander from place to place on their clothing and sometimes bring it along and transfer it to homes with no pets? It may be tempting to assume your furniture is clean if you can’t see any visible soil or stains. But it’s usually not what you see but what you don’t see that can be scary. Visit our upholstery cleaning page and Try a few simple tests to see if your upholstery can pass the clean test. "On average every 12 -18 months but homes with pets and kids may need more frequent cleaning". How long will my furniture take to dry? Most upholstery will dry in about an hour or two. Micro-fiber can take a bit longer to dry. In any case this depends on the level of soiling. On average it takes about an hour and a half to clean a regular six to seven foot sofa. A few variables would include pieces with very high soil load and loose cushions.. Protective Coatings do they work? Our furniture is a place to relax, spend time with family and a place where we consume food and beverages. 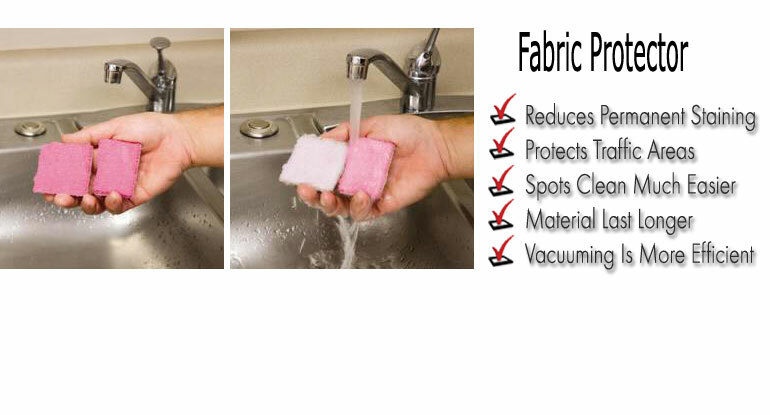 Fabric protection will make spot and spill cleanup painless. This odorless, colorless product is designed to repel oils and spills. It also helps to prolong the life of the furniture. This product allows spills to bead up so they can quickly and easily be wiped away. If you notice on the onsite protector demo below the fabric swatches on the left are both stained with a red dye. One has been treated with our fabric protector while the other has not. As you can see the one with protector repels the dye and the other is permanently stained. Below is some basic information about water damage cleaning and drying services. For some more FAQ please visit our water damage cleaning page. Fire & Smoke Damage Cleaning? Below is some basic information about fire & smoke damage cleaning and odor control. For some more FAQ please visit our fire & smoke damage cleaning page. 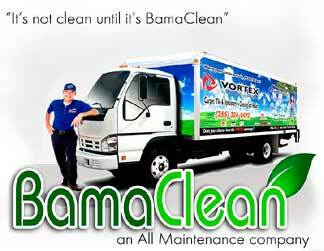 When you find yourself in a water, fire or smoke damage crisis, call on the shoals area professionals at Bamaclean. If your home has been through a fire you may have had the fire extinguished with water and in some cases a lot of water. So in addition to smoke and fire damage the water damage is as equally important to address. Mold can begin to develop in as little as 48 hours under the right environment so it is a concern and delaying water damage clean up is not advised. If you have smoke or soot damage it is crucial that emergency corrosion mitigation services be started as quick as possible to prevent permanent damage to your home and its contents from corrosion caused by soot. Your Bamaclean water damage service Professionals will respond immediately and use specialized high capacity equipment and techniques to remove the water quickly and we will closely monitor and document the drying process. We will also begin corrosion mitigation services that will prevent secondary damage to your home and belongings. You can rest assured knowing that your property will be thoroughly and properly inspected and all necessary action taken to protect your home and belongings from additional damage. We understand that this is a difficult time for a home owner and the circumstances can leave one overwhelmed and confused. Our service technician will go over every step and detail with you so that you’re fully aware of what will be happening in your home or workplace. Fortunately, in most instances, your insurance will cover most if not all damages sustained to your home and belongings. Our service technician will be able to help you start the insurance claims process in order to quickly handle the situation. With the right preventative information and a good expert at your side, any water, fire or smoke damage issues you face should hopefully be minimal and resolved before you know it. How to get ready for your cleaning services? Note: Room sizes, a room 200 sq ft or less. Combination rooms may be considered two or more rooms. We recommend protecting your carpets and upholstery investments with Scotchgard or Maxim advanced after cleaning. More information about this and other services is available on our website. Thank you for trusting us with your cleaning project. Our goal is to provide you with the most outstanding service experience ever. Good preparation on your part allows more time toward cleaning and helps everything go smoothly during the job. Arrival time: We are usually pretty good about arriving as scheduled. That being said please consider that our jobs can sometimes take more or less time to complete than scheduled. Circumstances such as customers adding more services, reducing services and changes to our route for increased efficiency can easily result in adjustments to the schedule. So on occasion we may arrive earlier or later than scheduled. In either event we will always keep you posted and call approximately 30 minutes prior to our arrival so that your not inconvenienced. If possible Please vacuum your carpeting before we arrive. Please clear vehicles from the driveway. We will need the space closest to the door we will be entering. If you might have to leave while we are cleaning please remove your car from the garage and park it on the street before we arrive so we don't block you in. Please pin up any full length draperies so that they will be at least 6 inches off the floor. Also, please pin up any skirts on upholstered furniture which may be touching the carpet. Please call to your technicians attention any spots or stains which may require special techniques. For your pet's peace of mind (and ours!) please put them in a safe, quiet place where our cleaning won't disturb them. Furniture moving: The following suggestions regard furniture moving. There is no charge to move small furniture. We are professionally trained to move your furniture. After the cleaning is completed, we will return it to its rightful place on protective padding as needed. We do suggest you remove items off of your furniture like electronics, plants, lamps and knick-knacks. We will move most furniture that can be safely moved. There are several items we will not move, including: pianos, electronics, china cabinets, beds, dressers with mirrors, pool tables, items with loose legs, very heavy pieces etc. Please clear floors of toys and other small items in the room being cleaned as much as possible. Any small pieces of furniture such as dining room chairs, magazine racks, plants, end tables and any other small to medium furniture should be removed from the rooms being cleaned if you’re able. You may want to use areas not being cleaned for temporary storage. “Budget Packages” typically do not involve any furniture moving however we can move end tables, coffee tables, dinning chairs and night stands or similar if requested. If we are cleaning the traffic areas “Budget Package” in a bedroom you may place small items on the bed. If you wish to have the beds or larger furniture moved our “Deep Clean Package” please do not load them up with other furniture or items. Please advise your technician about any special requirements to follow when moving your fragile furniture; weak legs, loose tops, etc. Any small pieces, such as dining room chairs, magazine racks, floor plants, etc. that you can remove from the carpet to be cleaned will shorten processing time and return the carpet to normal use sooner. China cabinets, sectional sofas, entertainment centers, antique and fragile furniture cannot be moved. However, carpet underneath such items can be hand cleaned where sufficient room is available, or we can edge right around the base. We have spray shields on all our cleaning wands so your furniture is not at risk. When you schedule your cleaning you should receive an arrival time window. We make every effort to keep our appointments, however on occasion we may have to adjust our schedule. We will not rush through one job to arrive on time to the following job. By being prepared you can help us to maintain our schedule. If for some reason we have to adjust our schedule we will give you a courtesy call to let you know. Likewise, if for some reason you must change or reschedule your appointment or adjust the cleaning order please give us as much notice as possible. Thank you!!! By being prepared you help make our job easier and allow us to be more efficient. We look forward to serving you. Here are some tips for after we have performed our cleaning services. Turn off humidifiers on furnace. Turn your thermostat fan control setting to "On." Run floor fans over carpet. Do not remove the plastic pieces placed under legs of furniture until carpet is absolutely dry. Preferably allow several days to allow moisture trapped under the plastic to evaporate therefore preventing rust or permanent furniture stain. If possible, avoid walking on damp carpet. If this is not possible, use inside shoes (slippers or sandals) to walk on it. We can also provide you with a pair of booties. You may also walk on the carpet with clean white socks. If you must go in and out over the damp carpet, wipe your shoes thoroughly with a wet cloth each time before walking on carpet. Dirt will track off on damp carpet very easily. 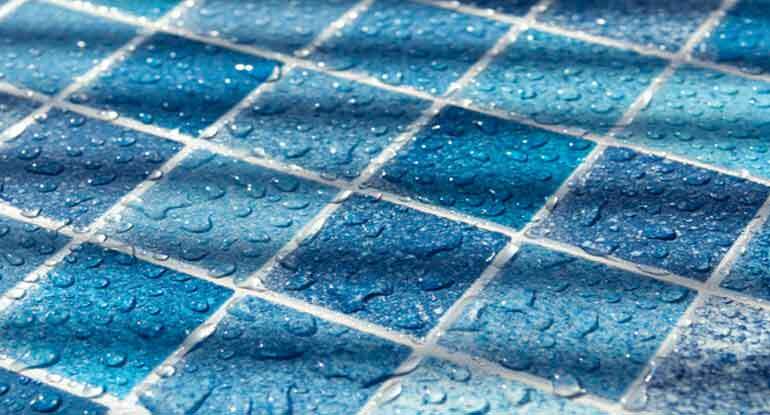 Be VERY careful walking onto a hard surface (tile or wood) because it will be slippery! Do protectors and sealers work? Most carpets are treated with stain resist properties and soil resistors known as Dupont Teflon or 3M Scothgard. After a period of 2 to 3 years, some of the soil-resistor wears off. At that point you should consider having a professional carpet cleaner re-apply the treatment after professional cleaning. The soil resistor will help the soil slide off of the carpet easier when vacuuming, spots will be easier to remove, and professional cleaning will be more effective.If you notice on the onsite protector demo below the fabric swatches on the left are both stained with a red dye. One has been treated with our fabric protector while the other has not. As you can see the one with protector repels the dye and the other is permanently stained. Grout Sealers, do they work?
" After a flash flood soaked several rooms, a hallway and a gymnasium tile floor in our church, AJ and his crew were on site within a short time extracting water to prevent further damage. After a few days of continually drying the space was restored completely with no trace of water damage. " " My favorite Carpet Cleaner! Definitely the best carpet cleaners I have ever used.!" " We had a stain in our carpet we thought they wouldn’t get out…I was wrong! They did remove the stain and stayed gone, unlike others we’ve tried before "
"These guys are really a great bunch. Kept me posted as to their time of arrival and showed up on time. Two service guys they worked quickly, were very polite and uniformed. Good job Brandon and Jose." "He and his crew were very friendly and got the job done in a timely manner. Kept us informed . We were very satisfied with the services." "He is a very godly man and did the job within the time frame that he said he would. He followed up with his work. "